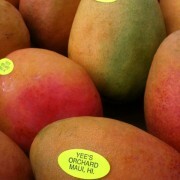 Yee’s Orchard is a 20-acre farm in Kihei, Maui, has been operated by the Yee family for more than 60 years. They specialize in growing Golden Glow mangoes. They operate a fruit stand and it’s open daily except Monday and Friday from 11 a.m. to 5 p.m, cash only. On Oahu you can find their mangoes at the Made in Hawaii booth at KCC Saturday Farmers’ Market.